The first phase of a £2.5m refurbishment project for North Kesteven Sports Centre was officially opened on Saturday 6th September 2014. The old sand based pitch was recently replaced with a new modern 3G pitch which will provide a great training facility for the local community. The 3G pitch, which will meet both Football Association and Hockey Association standards is a blend of grass-like fibres attached to a special backing with a mix rubber crumb brushed in. 3G pitches are one of the major innovations of the last 10 years in the game of football. The development of these 3G Football Turf pitches now replicates the playing characteristics of the best quality natural turf pitches, unlike those of the 1980s and 90s. 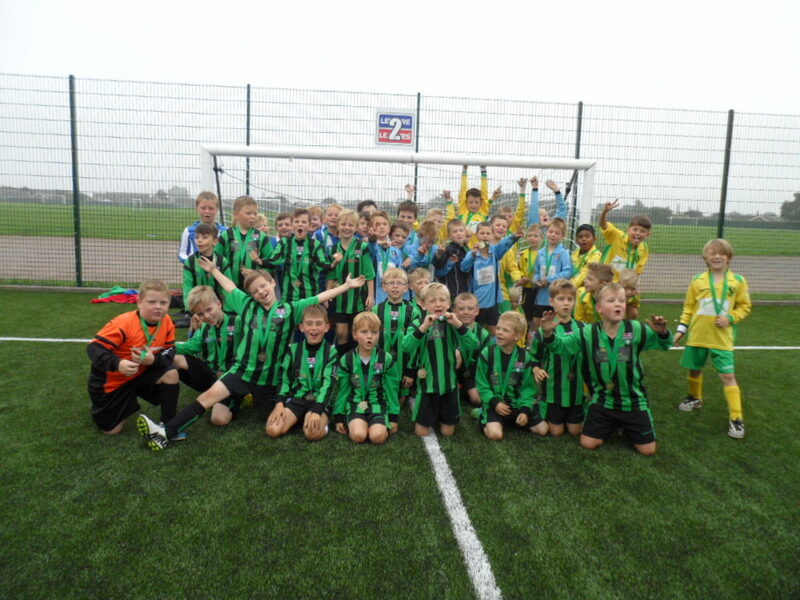 One of the largest junior football clubs in Lincolnshire whose home of football is the north Kesteven Sports Centre were invited by the project contractors Robert Woodhead Ltd and 1life who manage the sports center to organize a football festival to celebrate the grand opening. Ten teams in total at Under 9 and Under 12 level played out a series of fun games with teams present from Greenbank FC, Nettleham FC, HBW United, Birchwood Boys and North Lindum Hawkes. Whilst the Under 9 games were non competitive in line with the new FA guidelines to encourage development of players in a fun and friendly environment the Under 12 teams contested in competitive mini league which saw Greenbank Buccaneers and North Lindum Hakews progress to the final. Greenbank Buccaneers managed by Jamie Llyod were the winners and were presented with a trophy kindly donated by the contractors Robert Woodhead Limited. All players who took part in the event were presented with a medal to remember to the day. Counciller Lance Pennell was on hand to officially declare the pitches open and hoped that the new pitches would bring enjoyment to the local community for many years to come. The chosen charity for the event was the Lincolnshire and Nottinghamshire Air Ambulance Appeal, to which a cheque of £1,000 was presented by Mat Hall from Robert Woodhead Limited who held a project team tournament in August. Teams from North Kesteven District Council, Scape, the organisation which the project was procured through, Woodhead and 1Life played in in a 6 aside competition to raise funds for the charity. Greenbank FC spokesperson Julian White agreed that the new pitches would benefit so many children and this major investment by the council would benefit grass roots football for children as young four giving them the best facilities to develop their game. Matt Stothard area manager for 1life agreed that the workmanship of the project has been first class and is looking forward to the continued development of the sports centre.